Ferries Del Caribe - View timetables, Compare and book ferry tickets at directferries.ie. 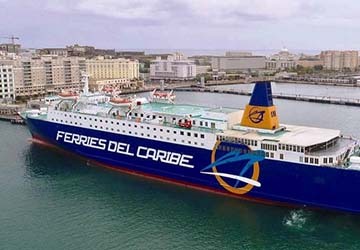 Ferries del Caribe connect Dominican Republic with Puerto Rico sailing between the ports of Santo Domingo and San Juan. Founded in 2004, Ferries del Caribe are the top choice for transporting you on the 250 mile journey between Puerto Rico and Dominican Republic. They depart for the 12 hour overnight crossing from Santo Domingo on Sundays, Tuesdays and Thursdays, sailing back overnight from San Juan on Monday, Wednesday and Friday evenings. There are no sailings on Saturdays. The fun starts as soon as you step on board Ferries Del Caribe which provides a fun filled entertaining cruise like experience. Built in Japan in 1990, the ship can carry around 1750 passengers and 70 cars. On board you’ll find comfortable and spacious passenger lounges with Pullman style chairs and a selection of inside and outside en-suite cabin accommodation. For those who’d like to upgrade, the larger Deluxe Ocean View cabin features a spectacular ocean view with a fridge, tv, double and single bed and en-suite to accommodate three passengers. The master suite is bigger still with a double bed. In terms of entertainment, the captivating Open Deck features a well-stocked bar and television screens to keep you occupied. For late night entertainment, the Del Mar Bar boasts magnificent scenery and a seductive atmosphere, not to mention a great bar and music. If you fancy a bite to eat, the restaurants open for breakfast from the early hours of the morning and guests are welcome to sample the buffet come the evening. The Ship’s Tax Free Shop provides a variety of products including souvenirs and alcohol and is open while at sea. Direct Ferries provides a ferry timetable and price comparison, based on your search criteria, allowing you to compare Ferries Del Caribe products with multiple ferry company timetables and fares in one search. Compare Ferries Del Caribe timetables and prices now with all alternative ferry operators before booking your ferry ticket to ensure you get the best option for your ferry trip.